Iron Wash is one of the longest drainages in the San Rafael Swell, starting in the flat plains of Sinbad Country and exiting through the reef via a large but not narrow canyon then heading northeast and joining Straight Wash, which emerges from the mouth of Eardley Canyon. The North Fork of Iron Wash forms the next canyon south of Eardley, and is deep and enclosed for 5 miles though only a short section in the middle is a true slot, and as this has drop-offs and pools at its lower end, those not equipped for rappelling will have to return the same way. Overall, a lot of walking is needed to see quite a short stretch of narrows, but canyons don't come much more remote or unspoilt as this. The start of the unsignposted side track that leads to the trailhead is at milepost 148 (west side) of UT 24, the well-traveled route between Hanksville and Green River. The track is also used to reach the lower end of Eardley Canyon, and after 1.1 miles passes an old corral that makes a good place to park or camp. Just 0.2 miles further it descends over a ledge with one rough spot that might prevent 2WD vehicles from continuing but the route to Iron Wash starts just another 0.2 miles beyond. The steep place is more of a problem if continuing to Eardley, as the trailhead for that hike is still 2 miles away. The corral is far enough from the traffic on UT 24 to be perfectly peaceful, and affords great views up and down this part of the San Rafael Reef. 8 views of North Fork of Iron Wash.
TopoQuest topographic map of North Fork of Iron Wash; the slot is north of 5060T. The slot in the middle part of the canyon ends with a drop of at least 20 feet above a deep pothole and cannot be followed in the upstream direction, but the trip to this point still makes for an enjoyable hike, and an easy one as the route is on or beside the flat streambed all the way, starting where the access track crosses Iron Wash about 0.5 miles from the corral. At this point the wash is sandy and open, but upstream, low cliffs soon rise at either side and in 0.5 miles, the North Fork enters on the right, while the main drainage continues southwest for several more miles before also turning towards the reef (and meeting one other branch that forms a named canyon - Ernie Canyon, after 2 miles). The North Fork wash is soon blocked by a big pool and a dryfall, easily passable by climbing around to the right, then above, the streamway is very wide and sandy for a while, with only low, crumbling, ledgy walls at the far edges. 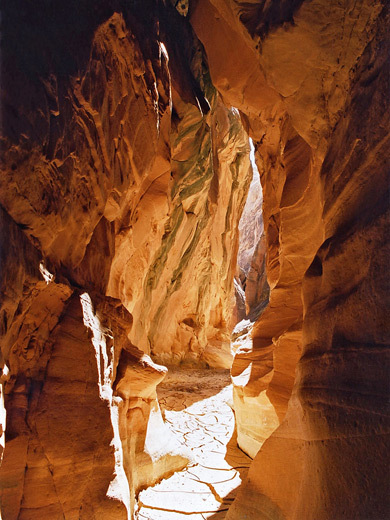 Higher Navajo sandstone cliffs rise ahead, and at their base the wash splits, the main branch bearing left, into a box shaped canyon shaped by vertical walls up to 400 feet high. It has several gentle bends than a larger curve to the northwest as the narrows begin; the streambed is now rocky, and contains several potholes and patches of sticky mud, and is like this for a few 100 yards until it constricts and reaches the lower end of the slot. This has a big pothole several yards deep with a narrow crack beyond. Webbing attached to an old log wedged high above provides a means to descend if traveling downstream but there is no way to climb up. The ceiling of this chamber is quite prettily colored by reflected orange/yellow sunlight, and streaked by black stripes. The slot is a little over 4 miles from the trailhead at the corral so a round trip takes 3 hours or so though the hike could be extended by continuing to the upper part of the narrows - walking back a mile then scrambling up a steep ravine on the right side, veering right near the top and on to the flat plateau above then heading southwest along the rim to intersect the route described below. 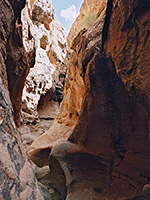 The upper canyon can be reached after a walk of 4.5 miles cross-country. The land is quite open and mostly level so route finding is relatively easy, with just a few streambeds and gullies to cross. From the parking spot at the corral, the quickest option is probably to walk in a straight line just north of southwest, over Iron Wash after about 2 miles and up the gently sloping sandy/stony hillsides beyond, meeting the rim of the canyon of the North Fork about where it turns sharply northwest, then to follow the rim, above the slot section, where the surroundings become entirely slickrock, and finally down a small ravine to the streambed. 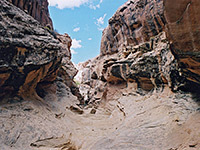 Turning right, the wash enters the narrows, which are formed largely of many swirling potholes and framed by smooth, light cream colored rocks, with darker, more angular cliffs above. The streambed is liable to have long patches of clayish mud, quite slippery and adhesive. 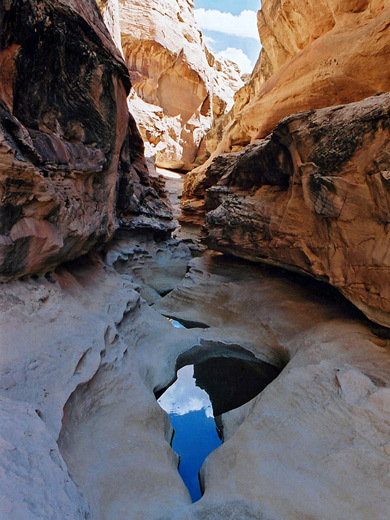 One or more potholes might have water/mud several feet deep and be difficult to pass, especially if traveling alone, so it might not be possible to reach the start of the narrowest, technical section of the slot canyon, which starts with a drop of ca. 15 feet into a deep, dark passage containing one very large pothole and other pools and dryfalls.